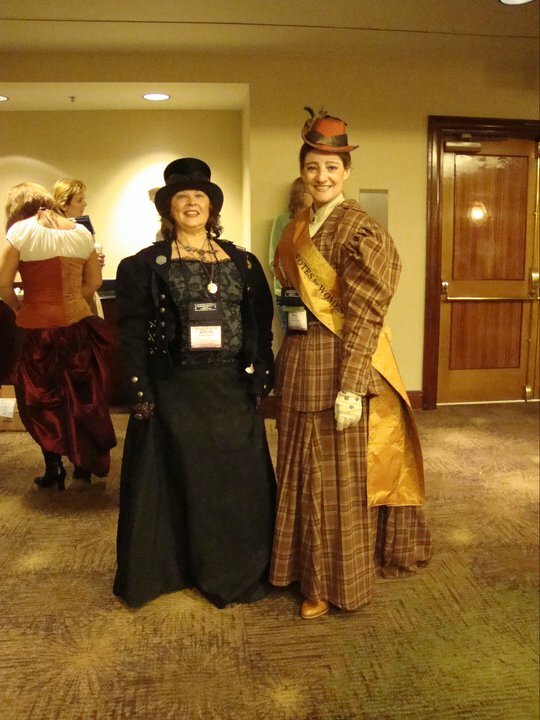 Steampunk Social at the Romantic Times Booklovers Convention | STEAMED! « Steampunk and gadgets and gears. Oh my! 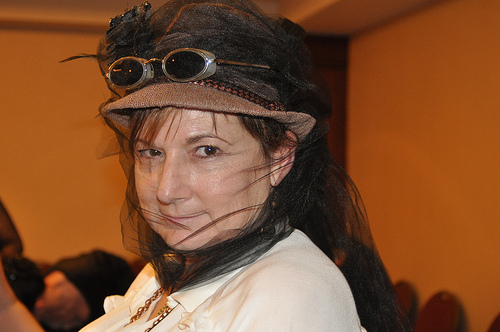 I am happy to say that Steampunk was everywhere at the recent Romantic Times Booklovers Convention, which was held in Los Angeles, April 6-10, 2011. Yes, I am finally just getting around to writing about it. Do you know how much time Steampunkapalooza takes? RT was amazing, I’d never been to one before and had a few reservations. There were several Steampunk panels — I was on one Steampunk panel and one about writing historical fantasy (with Gail Carriger, squee). One of the publishing houses, Samhain, had a Steampunk high tea. 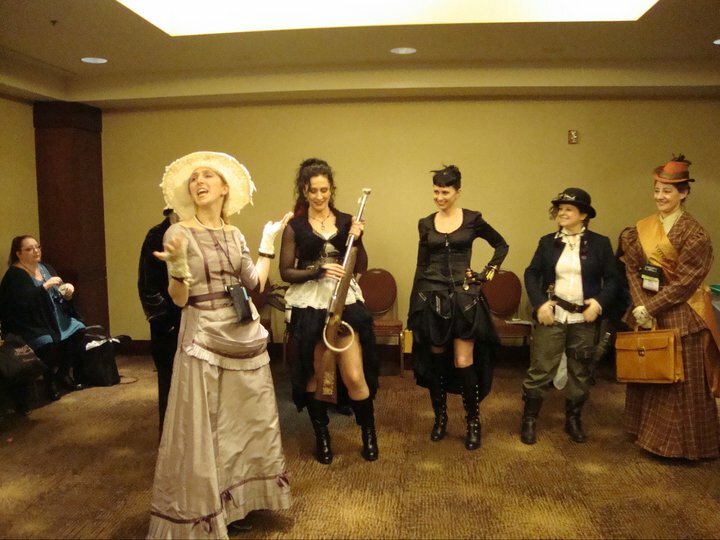 Then, of course, there was the Steampunk Social that I was in charge of along with Kady Cross, Kassy Taylor, Deb Schneider, and Seleste deLaney. I volunteered to make about 250 cakepops for the social–because you all know I’m a huge slacker and have nothing else to do than spend 10 hours baking. Per hotel rules, every cakepop had to be individually wrapped, too. Good thing I was local and didn’t have to fly them in my suitcase. 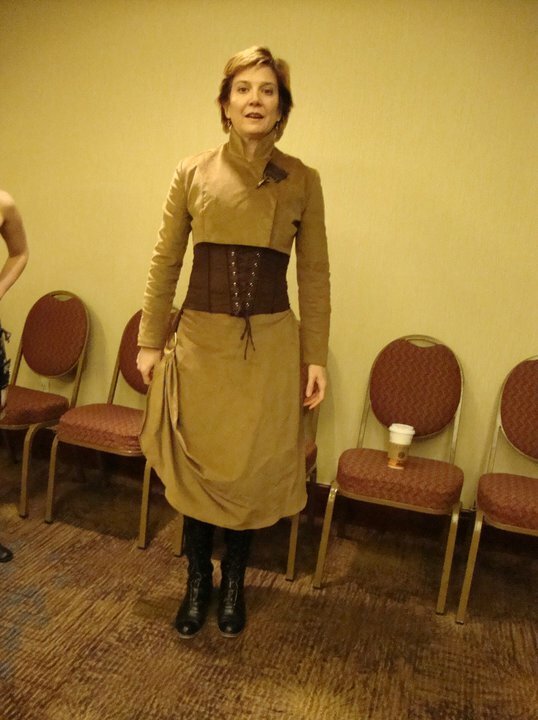 Also, I was in full Steampunk dress most of the time. Since Leanna Renee Hieber couldn’t make it I even wore (nearly) all black one day in honor of her, since usually she’s the one in black and I’m the one in pink. The social itself went really well. 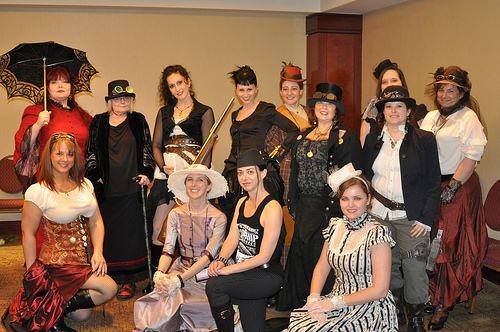 Close to 100 people gathered for Steampunk swag, cake and tea, a fashion show, a costume contest, and lots of door-prizes. But you really want to see gratuitous pictures of Steampunk clothing, not hear me babble about party planning. Here’s Kady Cross, the Steampunk track captain. And here’s the fab Kassy Taylor. Here’s Deb Schneider, along with the winner of our costume contest (the one in the sash). 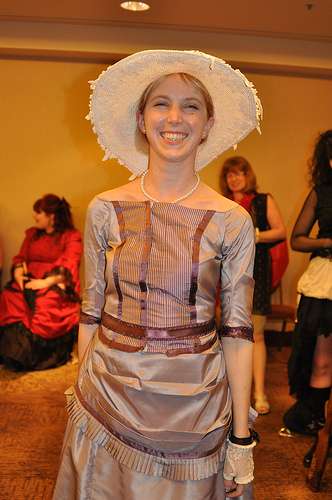 She *made* her costume on a treadle sewing machine. Wow. I don’t have a close up of Seleste deLaney. (Seleste, why don’t I have a picture of you?). Since this was tea and cake, I wore pink and a large hat for the occasion. Not that I need a reason to wear a large hat. The fashion show was a smashing success and everyone loved the pretties from Clockwork Couture. Here’s Beth and Erin (same dress, different color). Here’s Erin and Zoe Archer. We had several people come to the social in costume, so we had a costume contest. Here’s me getting the crowd to help us pick a winner. Can anyone identify these lovely ladies? We never got their names. Do you have a favorite outfit? A favorite flavor of cakepop? A random comment on Steampunk or Steampunk fashion? I have one more bag of swag and books from RT, including the *very last* swag bag left over from the party. I’ll give it to one lucky commenter. Contest closes April 30 at 11:59 PM PST. wondeful outfits. I’m a hat lover, so love seeing the variety of smart hats and veils. Yep, makes me start to think about my closet. 🙂 Thanks for sharing the pics! Glad you liked them. I do like hats. Suzanne–Your social looks like so much fun! I wish I could have attended. And cake pops? I have never tried them. What are they like? They look yummy. 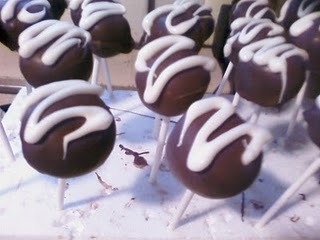 cakepops are cake and frosting dipped in chocolate–sweet and yummy. My favorite costume is Erin’s striped dress. Loved seeing all the costumed people walking around RT! Erin’s dress was cute, wasn’t it? How fun! I love looking at so many creative outfits. I have to say corsets and bustles are some of my favorite things in steampunk outfit. And a nice steam-powered weapon or two! I loved all the costumes too! Wow!!! 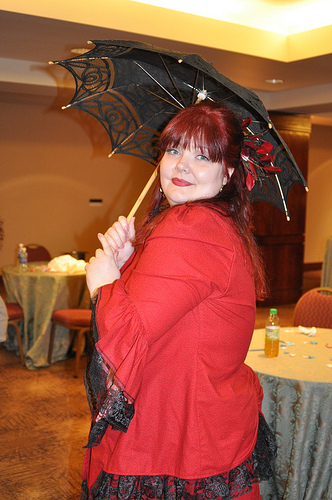 If I can participate in the Steampunk stuff again next year, I will be there with bustles on. Congratulations, Suzanne! It appears all the hard work—baking, eewww!—you and your team put into the Steampunk Social at RT was a delightful success. 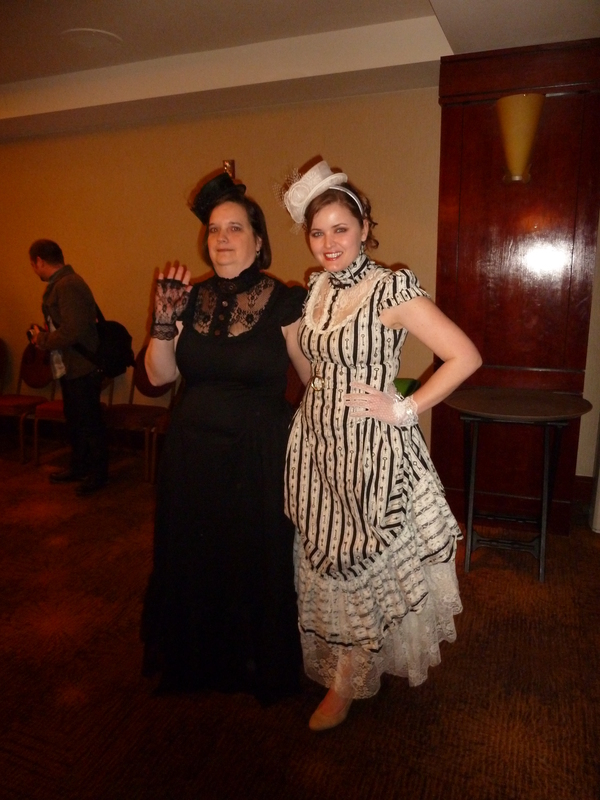 Lovely costumes… I was wondering, but just checked her web site and it doesn’t seem my friend Cindy Spencer Pape was in attendance—btw, cool Steampunk trailer from Carina on her page. Any chance you’ll be a presence at RWA in NYC this summer? As editors, we were asked recently what submissions we would like to see come across our desks in the future… My response, hands down, Steampunk! Oooh, pretties! Wish so hard I could have been there! on April 24, 2011 at 12:26 am Noah B.
I absolutely LOVE the dress in the third picture from the bottom!! I want one soooo badly now! Sounds like the steampunk social was just fabulous. I like Erin’s striped dress best, too, I think. Glad you had such a great time. Erin looked adorable, that was most people’s favorites, I think. Suzi, I’d have to say that you & Kassy Taylor are my favs! It looks like you had an amazing time there 🙂 Maybe one day I’ll be able to attend one & meet you there! All of the costumes are great. I especially like the dress that Erin is wearing. That dress is just so pretty! You looked lovely as always! As far as cake-pops go…I’ve never had one! I want one though–I was promised some for my birthday and it never happened (there was weeping). Contest is closed. Thanks for entering! You don’t have a close up of me because I don’t have a close up of me 😦 The pictures you do have are fabulous though! As for the ladies in the contest, the one on the left is Christina Cross, next to her is her sister Erica (pen name: Penny Dreadful <3). I'm not sure on Erica's last name though.